The twist of fate ! My disappearance from social media since I retired at the end of April, has to be put down to many challenges, and projects, interspersed by a series of horse-related accidents that have befallen me since then. The core of my retirement time has been taken up with riding four, sometimes, five days a week. Poor little Max didn’t know what hit him! Still, they were only gentle hacks around the country lanes for a few hours. These would take up half a day, once he had been turned out in his field, after which I could carry on with working to get my cottage, land and buildings, back to their former glory. Hacking through the undergrowth behind the stables (with my pruning saw, not my horse, tee hee hee), comprising nettles and overgrown elderberries, that hadn’t seen the light of day for at least six years, I discovered, to my horror, that the wooden back walls were suffering badly due to rot and woodworm. I would have loved to have replaced the planks myself, but my woodwork skills, I’m afraid, are non-existant. However, I’m a dab hand with a paint brush so, after purchasing new boards and giving them a couple of coats of creosote, John, a neighbour, removed and replaced the offending boards. I have done my bit by giving the two stables a couple of coats of the preservative. My, didn’t the wood drink it up! It took three times as many containers of the stuff to finish the job than I had bargained for! I’ve also creosoted the barn doors that, under close inspection, were found to be on their last legs. (I had thought this 23 years ago when I moved in!) So something needs to be done there, watch this space, as they say. Am dead chuffed because I’ve filled lots of holes in the barn walls with mortar, prior to painting them black. I chose not to use black tar varnish, which would have been used in days of yore, but went with Sandtex black masonary paint instead. It’s not shiney, and I feel that it’s kinder on the eye. Home paddock is looking brilliant, with 85% less buttercups after my purge on them this Spring. A few weeks after Max had tripped me up, with me landing flat on my back in front of him on the road, he bucked me off in a stubble field. Luckily somebody in a local farmhouse was on hand to call 999, as I didn’t know where I was! I spent the next hour in an ambulance! It was my first time in an ambulance and in the care of paramedics who were lovely. Fortunately, I was wearing my back protector, and, despite having been catapulted out of the saddle and landing with a crash on my back on the hard ground I suffered no more than mild whiplash ! This couldn’t be said for horse-related accident number three. Last Wednesday, we had been out for a lovely gentle ride (needless to say not on any stubble fields!) when, like every ride for the preceding 7 years the time came to dismount (get off, to the uninitiated). Easy peasey. Feet out of the stirrups, lean forward swinging your right leg over the horse’s rump….As I was at the point of no return, i.e. swinging my leg over his rump, for a reason only known to him, he decided to take a step away from my movement, leaving his front left leg behind. At this point I had started my descent…. and my right foot, instead of landing squarely on the ground, came down on his foot and the force of landing crookedly twisted my ankle over. Such excruciating pain! Ouch!! With difficulty I hopped him into his stable and untacked him and let him out in the paddock and hopped into the house. I continued in this hoppity vein (with the help of my late mum’s walking stick) for the next two days (with more help from a friend, Nicky, who looked after Max for me). 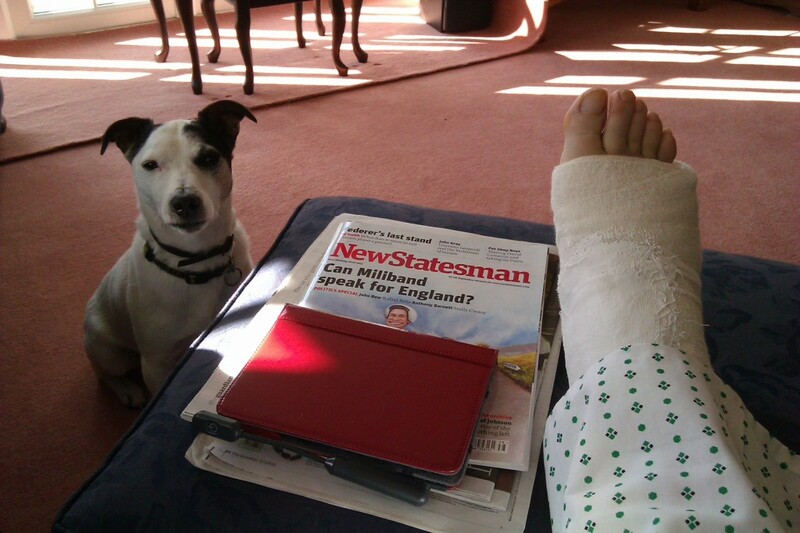 Tried the frozen pea trick (well frozen mange tous actually) to bring the swelling down. Fortunately I had some Volterol and painkillers, which made it all much more comfortable, but my foot and ankle swelled and became bluer each day that passed. I had phoned 111 the NHS helpline on Thursday, which I thought was defunct, but the nurse was lovely, and very helpful saying that it sounded like a bad sprain. However, if my foot went numb, or I had more pain or pins and needles then I was to call an ambulance. I didn’t want to drive the 13 miles to the A&E as I worried about my insurance should I have an accident, driving with a dodgey ankle. Also if I got to the hospital, and my ankle was found to be broken, how would I get my car home? Didn’t like to divert an ambulance away from a serious case, just to help me. Didn’t like to trouble a neighbour to drive me into the city. What a dilemma! So I just continued hopping around. Poor Alfie, my new addition to the family, was having to make do with just a hoppy walk down the drive and dashing around after his tennis ball. On Friday evening, after a long Skype call with my brother in Sweden, I decided to call 111 again as I was getting really bad pains up the back of my leg. The outcome was an ambulance arriving at ten minutes to midnight to take me to A&E. My goodness twice in an ambulance in my lifetime and both within 3 weeks! How crazy is that? They supplied me with a snazzy pair of hospital jim jam bottoms; plastered my leg; gave me a rush course on how to walk on crutches and released me into the wide world. Well, into a taxi that took me home, arriving at 6.15 a.m Saturday morning. Can we go out for a walk now mum? Next post will relate the trials and tribulations of a 65 year old, on crutches, for the first time and a few tips for those who find themselves in the same position. Oh Lynda, what an unfortunate turn of events! At least you have lots to blog about! Thanks Jen for your comment. Yes, loads to blog about, but have just been too busy over the summer to post anything. Hopefully, I’ll be back blogging and taking photos once I’m mobile again. Hope all is well with you and the family. Well Lynda that was quite a post and quite a story. My Morlupo life looks pretty dull in contrast. I do hope by now you have become an expert with the crutches or perhaps you have thrown them to the winds!! My son Daniel can always come up with a pair of stilts for you, but perhaps not a good idea at this time. Waiting with trepidation for the next episode. Much love for now and glad that you are back on line. Hi Val! Thanks for your comment. Am just about to write another post, it’s such an effort sitting in the chair for most of the day… Haven’t time to do anything, tee hee hee! Will save the stilts until later, thanks for the offer though! Hi Denise, many thanks for your comment and best wishes. It’s all part of life’s rich pattern. Think, I could have broken my back when Max bucked me off the other week. A broken ankle is minor in the scheme of things! When are you coming to see me? That would be great, too much time has passed since we last met up! Oh bless you, you really have been in the wars haven’t you? You need to be more careful, make sure you’ve got your mobile phone with you. Alfie looks very sweet, when did you get him? Thanks MrsBoyandMe. Mmm, three horse related accidents in the last six weeks. Not good. But in the scheme of things, a broken ankle isn’t too bad. Better than a broken back, anyway. Alfie chose me when I went to get some hay from a friend. He jumped up on me as if I was his long lost friend, waved a paw and smiled. Wasn’t looking for a dog. My friend asked me if I would like him. He was her mother’s and she had died earlier this year. So he came on three week’s trial. If he chased a cat (only one left, Maisie went off and didn’t come back six weeks ago) he’d go back. He is really good, very wary of cats (my friend had three), very obedient, for a Jack Russell, very loving and eager to please. Everybody loves him. He gets on really well with Minnie and is such a jolly little fellow!